Habitat : Throughout india, growing abundantly immediately after rains. 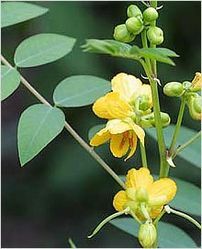 Uses : The plant is bitter, purgative, laxative, anti-inflammatory, expectorant, hepatoprotective, anti-malarial, analgesic, vermifuge and febrifuge. It mainly used to detoxify liver, use to cure internal bacterial and fungal disorders, to kill parasites and viruses, enhances immunity, and promotes perspiration. It is also helpful in cough, convulsions, reduces blood pressure, reduces spasms and as cardiotonic. Seeds are brewed into a coffee-like beverage for asthma, and a flower infusion is used for bronchitis. Leaves are used in the treatment of gonorrhea, fevers, urinary tract disorders and edema.